Kevin’s recovery was significantly worse because of his behavioral issues after severe brain injury. Many times a brain injured client can become angry and even violent. In a domestic situation, this kind of problem often ends in marriage issues and divorce. This is very disrupting to the recovery of the patient because they lose most of their support system when this happens. The person most likely to be at risk from the still not well understood mood swings is the spouse and family. This is one of the greatest costs, not just to the patient, but to society from discharging a client too early from rehab. The spouse is really important to long-term recovery of the patient from traumatic brain injury. Yet behavioral issues after severe brain injury combine with too early a discharge can negatively affect the spouse and the marriage. The transition back home must be long and gradual. Without this key ingredient, the effect of denial and behavior extremes becomes very severe. The chance of marriage failing after severe TBI increases when the patient is male because the risk of violence is greater because of the superior strength of most men over their wives. Also sexuality is key to a man’s identity. Being babied and taken care of like a child can threaten a man’s sexual identity. Again, discharge before these issues are identified and treated creates a risk. Kevin had trouble speaking to exactly what happened in his marriage, but his marriage took a hit. His behavioral issues after severe brain injury made simple things at home upset him like his daughter not cleaning up a mess she made. His behavior was deemed unacceptable by his wife. She seemed to think he wasn’t ready yet to come home. His wife went so far as to try to help him by buying him a book called, “Don’t Sweat the Small Stuff.” But this didn’t seem to help. His wife thought he had changed, and he was no longer the person she fell in love with. When his behavior become more aggressive and unmanageable, his wife and brother brought him to Lakeview to stay on a locked floor. Additional factors contributed to his admission to Lakeview. There was some financial pressure on Mercy Hospital to say that he had reached a plateau in his recovery so that he could be discharged. 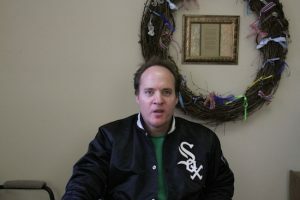 His wife chose to place him in Lakeview after his discharge home so he could get the more focused treatment he needed. Lakeview focuses on traumatic brain injury rehab. He stayed in Lakeview in Hartford, WI until October 2001, more than a year after his original injury. Kevin and his wife never really lived together again. Four years after his brain injury, they divorced. She would come to visit him, but his rehab didn’t patch the wounds his time at home had created. She never trusted his moods again and felt he was a different person with a different personality. Intimacy is very hard after brain damage. Frontal lobe damage impacts a spouse’s ability to do the little things that makes the partner feel cared for and appreciated. Interaction between husband and wife becomes distorted. With distortion can come frustration, leading to behavior extremes. He expressed his frustration with the end of the marriage. “I thought marriage was supposed to last a lifetime,” he said.